On Saturday March 17th, The Eastern California Museum in Independence invites you to attend a 50-minute history program titled Mulholland…the Final Chapter. 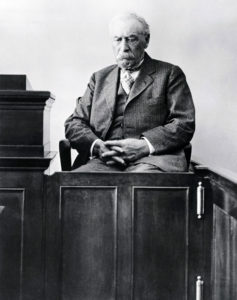 The subject of the history program is of one of the largest disasters to have taken place in California, which conjointly brought about the somber ending to the illustrious and tumultuous career of William Mulholland, the founder of modern-day Los Angeles and the malefactor of the Owens Valley. Using historic photographs and extensive research, local historian David Woodruff will discuss the 1928 collapse of the St. Francis Dam near Saugus, the resulting death and destruction caused by its torrential flood waters and the affect in had on bringing William Mulholland’s career to an end. The St Francis Dam was an integral part of Mulholland’s Owens Valley–L.A. Aqueduct system. It was the completion of the Aqueduct that enabled Los Angeles to grow 500% in just 20 years, and engendered Mulholland to the status of deity among the citizens and chamber of commerces of the southland. And conversely, it was the calamity at the St. Francis Dam that condemned him to live his final days in shameful anguish. 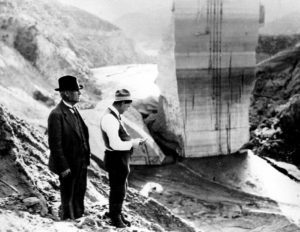 William Mulholland and his assistant Van Norman inspect all that reamins after the St. Francis Dam collapsed in March of 1928. The program Mulholland—the Final Chapter will be held at 2:00 p.m. Saturday March 17th at the Eastern California Museum in Independence. The program is free and open to the public…light refreshments will be served. For more information call 760 878-0258.